For my earlier posts on Cockygate from May 5th and May 28, click here and here, respectively. I’m just going to skip over all the preliminary stuff and just get to the good news: the Romance Writers Association and the Authors Guild won a court ruling on Friday against Faleena Hopkins, the notorious romance author who put a trademark on the word “cocky” and then sent letters to authors who had books with “cocky” in their titles, threatening legal action if they didn’t take their books off Amazon or change their books’ titles. Now, if you read my post from last week, you may remember that Hopkins’s lawyer had sent Kevin Kneupper, the novelist and retired lawyer who’s leading the fight against Hopkins, along with author Tara Crescent and publicist Jennifer Watson, a letter with intention to sue them, as well as filing a Temporary Restraining Order (TRO) against the Petition of Cancellation for the trademark. Since then, it’s also come out that Hopkins was asking for another TRO against the publication of a collection of stories called Cocktales: The Cocky Collective, which was named as an obvious protest against her trademark (Jennifer Watson was incorrectly named by Hopkins as the publisher of the book in the papers filed for the TRO). Kneupper was dismissed as a party to the lawsuit Hopkins’ lawyer filed, meaning he’s free to continue fighting against the trademark. Hopkins did not get her restraining order, so the petition and all the other legal battles against her can continue. Finally and most importantly, for the moment books with the word “cocky” in the title can be published, including the Cocktales anthology. In ruling against the author Faleena Hopkins, who claimed exclusive rights to “cocky” for romance titles, Judge Alvin Hellerstein of the Southern District of New York, stated that he did not believe that Hopkins was likely to succeed on the merits. In other words, the judge says that Hopkins’s trademark is on pretty weak legs. Now, there’s still a lot of work to do. For one thing, while people can still publish their books with the word “cocky” in the title, the final decision won’t be made till September at the earliest. That gives Hopkins, her lawyers, and her supporters (yeah, there are some out there) to come up with legal strategies for the trial and for any potential appeals, both from her side and the other side. And unfortunately, there are a number of copycats out there trying to get trademarks on common words used in titles. It’s a hot mess. But this is a bright spot in the ongoing saga of #Cockygate. I’ve heard from many authors who have expressed fear over the outcome of this controversy, and what it could mean for them if they couldn’t write because they could incur legal repercussions for using an everyday word in their story’s title. Hopkins’s defeat on Friday gives us all a little bit of hope that we can continue to not only write our stories, but give them almost any title imaginable and not have to worry about getting sued for it. 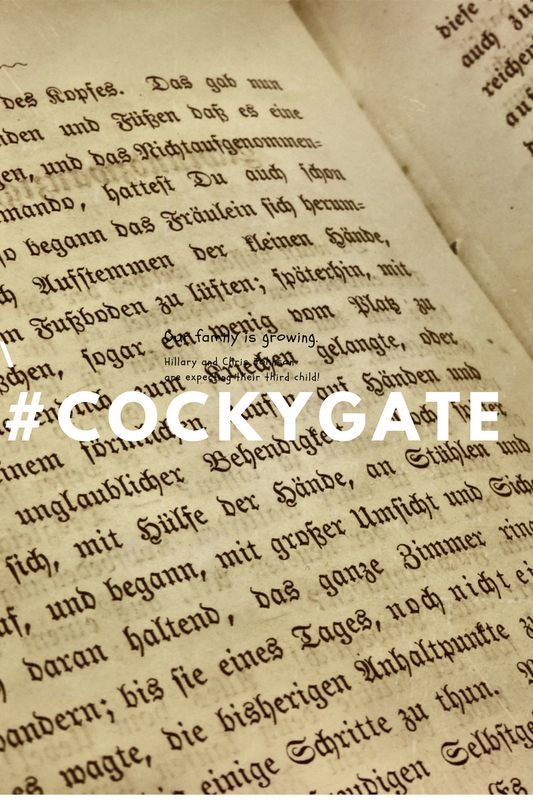 You can also spread the word on Cockygate and any developments in the scandal. The more people who know what Hopkins is doing, the more we can rally against her or anyone else trying to copy her. The louder our voices, the stronger we are, and the better positioned we are to affect positive change. And finally, if you’re a writer, continue writing. Don’t let fear get in the way of telling the stories you were born to tell. Like the people behind Cocktales, when we decide to put something out in defiance of bullies, we make a statement that we’re not going to take this sitting down. That’s all for now, everyone. If there are any other significant developments, I’ll post about them. Until next time, pleasant nightmares. UPDATE 6/3/18 @ 7:18 PM EST: Erica Unsophisticated Blood Thirsty Wolf Fisher (@monet5280) informed me over Twitter that both Ms. Crescent and Ms. Watson’s lawyers are working on a motion to dismiss, which will be due in on June 22nd. In addition, Ms. Hopkins has to respond to the Petition of Cancellation from Mr. Kneupper no later than June 23rd. So it looks like things will be heating up longer before it starts to get cold again. Here’s hoping the end of June brings more good news like what we saw on Friday. *Just be careful before you donate to any legal fund for those affected or claiming to be for any legal teams against Hopkins. There are a ton of people out there who have no qualms against taking advantage of those suffering in order to make an easy buck.